After a few weather delays, the tanner crab fishery opens today. It’s the first time the fishery has been open in the Kodiak area since 2013. KMXT dropped by St. Herman Harbor on Near Island to talk with fishermen before they set off. Fisherman Clint Johnson hands an empty bucket of hydraulic fuel up to his crewmate. He says they have 1000 gallons, the max the vessel can take. It tops the list the crew needs to check off in the next few hours. Johnson says it’s expensive to gear up, and it’s also no sure thing that the crew will earn more than it pays out. Johnson says he makes his living off salmon and the last time he fished for tanner crab was in the 90s. He says the vessel, the Kaiwik, hasn’t been rigged for crab for 30 years. On a nearby float, the Lady Ashley is also getting ready. Jim Monroe and his crew member peer into the vessel’s engine room, which is less a room and more of a nook. Two other crew members are on board, and Monroe says it wasn’t hard to find people to hire for the trip. His daughter, Darlin Monroe, is optimistic. Like the Kaiwik, the Lady Ashley is about to head off. Crews started warming up their engines as soon as registration wrapped up Wednesday morning. That’s according to Nat Nichols, Alaska Department of Fish and Game area management biologist for the Groundfish, Shellfish & Dive Fisheries. Nichols says the guideline harvest level is 400,000 pounds. 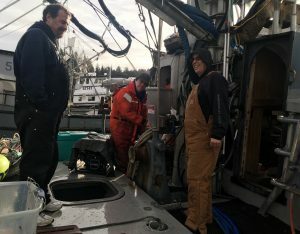 Fishermen need to call in their catches by radio, and Nichols says they’ll have a better idea of how fast fishermen will reach the cap over the next few days. He says the range is probably three to seven days, and March 31 is the end of the regulatory season.